The research group led by Professor Magnus Andersson at University of Helsinki has discovered a new inherited disease that causes ptosis, retarded growth, intellectual disability and mortality in Ayrshire calves. The disease proved to be associated with a mutation in UBE3B gene. Of the 129 tested Ayrshire AI bulls recently used in Finland, 17% carried the mutation. Moreover, UBE3B mutation may be connected to AH1 haplotype, which is associated with reduced fertility and has a carrier frequency of 26.1% in the North American Ayrshire population. The study was published in BMC Genomics journal on 12 October 2014. Heredity research traced the disease to a mutation in UBE3B gene, which partially prevents the normal expression of the gene. Mutation screening of the 129 Ayrshire AI bulls that are in use or have recently been used in Finland indicated a high carrier frequency of 17.1%. 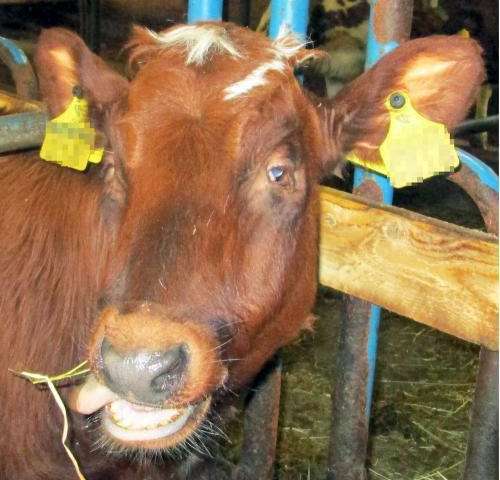 "The results of this study can be utilized in bovine breeding programs. With the successful prevention of PIRM syndrome the animal welfare can be increased and at the same time the financial losses for farmers and breeding companies can be reduced" says PhD student Heli Venhoranta. In humans, mutations in UBE3B gene are associated with Kaufman oculocerebrofacial syndrome with similar pathological findings as in PIRM syndrome. Furthermore, mice engineered to lack UBE3B expression were reported having increased lethality. The mutation in UBE3B gene might be connected to the recently discovered Ayrshire haplotype 1 (AH1). The haplotype encompasses the mutation in UBE3B gene and of those tested 129 AI bulls, 29 had a known haplotype status for AH1. AH1 haplotype is associated with reduced fertility which could imply embryonic losses that agree with the findings of UBE3B deficiency in mice. The AH1 haplotype was perfectly associated with the UBE3B mutation in this study cohort. The estimated frequency of the AH1 haplotype was 26% in the North America Ayrshire herd. "The relationship between PIRM syndrome and AH1 haplotype needs to be clarified but our study does however provide an avenue for further investigation" concludes Venhoranta. More information: "In frame exon skipping in UBE3B is associated with developmental disorders and increased mortality in cattle." BMC Genomics. 2014 Oct 12;15(1):890. DOI: 10.1186/1471-2164-15-890.